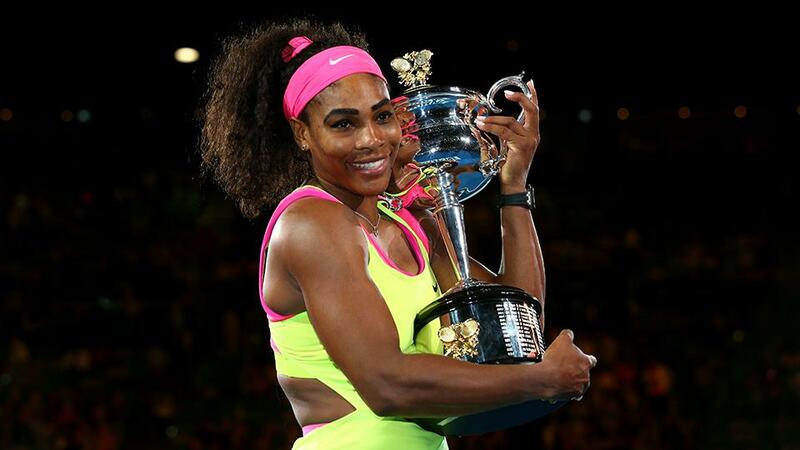 Serena Williams poses with her trophy after defeating Maria Sharapova of Russia in their women\'s singles final match at the Australian Open 2015 tennis tournament in Melbourne on Saturday. Serena Williams won her sixth Australian Open and 19th career Grand Slam with a hard-fought win over bitter rival Maria Sharapova on Saturday, consolidating her place among the game's legends. The 6-3, 7-6 (7/5) triumph means the American world number one overtakes 18-time major champions Martina Navratilova and Chris Evert to go clear second on the all-time Open-era Grand Slam winners' list, three behind Steffi Graf. Australia's Margaret Court, who played many of her match before the Open-era, has 24 titles. Evert, commentating on ESPN, backed Williams to eventually overtake Graf's mark "if she stays healthy, if he stays motivated". "Standing here with 19 championships is something I never thought would happen, I went on the courts with just a ball and a racquet and hope and that's all I had," said Williams, at 33 the oldest woman to win the Melbourne title. "I'm just so excited to have this title," she added, revealing that she had been "throwing up" when she went off court during a rain delay in the first set. The American has been battling a cold all tournament and was coughing during the match. The first Australian final in a decade to feature the tournament's top two seeds was a one-sided affair in the opening set, although Sharapova rallied to make a contest of it in the second, saving two championship points before falling to a third. The win extends Williams' decade-long run over the Russian to 16 matches, with the second seed hailing her rival's "incredible achievement". "I've got to congratulate Serena on creating history and playing some of her best tennis," she said. "I haven't beaten her for a really long time but I love every time I step out on the court with her because she's been the best and as a tennis player you want to play against the best." An intensely focused Williams outgunned Sharapova, cannoning down 18 aces, including a 203 kmh (166 mph) thunderbolt and glaring at her opponent during key moments as Sharapova struggled to stay in the match. Sharapova made a disastrous start when she double faulted to go down a break in the opening game, succumbing to pressure as Williams aggressively stood inside the baseline and easily read the Russian's intent. The American pounced on any tentative shots from Sharapova who resorted to drop shots in a bid to vary her tactics and avoid getting into a slugfest with the game's most powerful hitter.